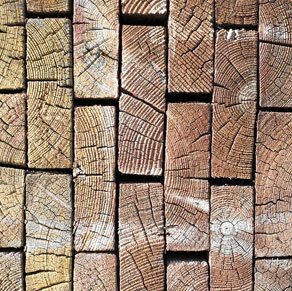 We are a family-run business with over 30 years of experience in the timber trade, and pride ourselves on the quality of our products, the value for money we offer our clients and our knowledgeable and honest customer service. All of our gates are bespoke and made-to-measure to make them perfect for you and your home. 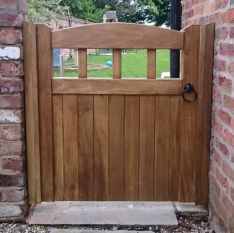 Village Gates are specialists in manufacturing and installing quality wooden gates in Manchester, Cheshire and the surrounding areas. 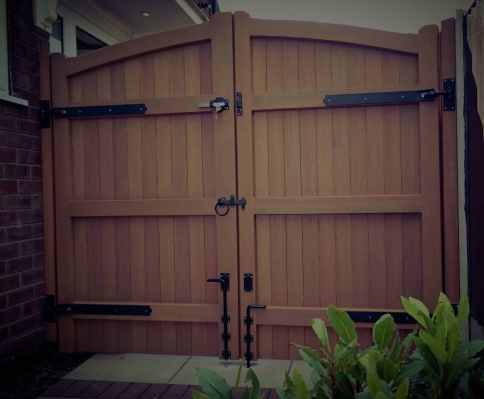 We offer wooden garden gates, driveway gates and electronic gates, and installation services for new intercom systems. 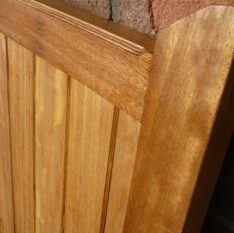 Our softwood gates are made with high-quality Scandinavian Redwood, while our hardwood gates can be made using Idigbo or Iroko wood from Africa, or Meranti wood from the Philippines. From the elegance of the Swan Neck, to the charm of the Appleton, our range of gates has something to suit every style. We can supply and fit any of our manual gates within a 30 mile radius of our premises in Warrington, and also offer automation installations within 30 miles. We also deliver all of our products throughout the UK, so if you’re looking for a long-lasting gate with a bit of style and finesse, then look no further! Everything we manufacture is completely handcrafted in our workshop in Cheshire, using the best sustainable timbers available. We take great pride in all of our products, and do not outsource any of our work to third parties. As a result of this, we are able to put customers at the very core of our business, and offer you quality products with a fantastic service. Creating the perfect gate for your home and leaving you with the look you’ve always wanted is at the very heart of what we do. Finding the right gates for you is our priority and our passion. Our products are high-quality and long-wearing, so that you don’t have to worry about any purchases you make with us for years to come. 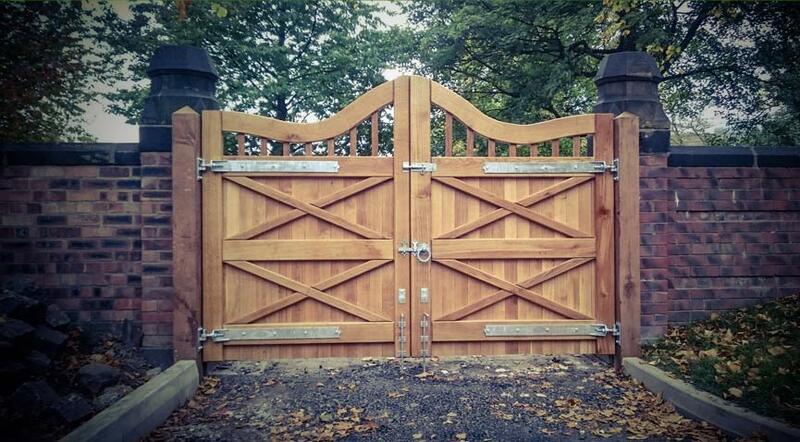 So whether you’re in the market for wooden garden gates, driveway gates, electronic gates or an intercom system, you can be rest-assured that if you live in Manchester, Cheshire, Birchwood, Glazebrook, Winwick, Cadishead, Irlam, Warrington, Stockport, or even further afield, we have the right option for you. Browse our website to see a selection of our quality wooden gates, or come and visit us at our brand new showroom and workshop in Warrington. 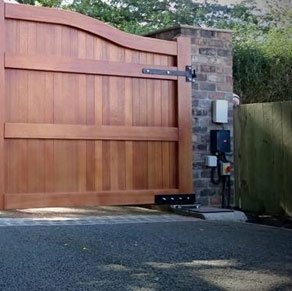 We are just off J11 on the M62 and have a variety of examples of our handcrafted designs available to view, with our knowledgeable and experienced staff on hand to help you choose the perfect gates for your home. Call us on 01925 552 322, or email on info@villagegates.co.uk, to see how we can help you find the perfect gate for your home. through our social media so why not check them out? Buy our gates online and they can be delivered right to your home. Village Gates were hired to complete a project for a Primary School in Stockport, Manchester. The brief was to manufacture swing gates in Oak in the style supplied by the architects. Our fitters installed two oak posts behind two existing pillars. We then hung the gates from heavy duty galvanised adjustable hinges to handle the weight of the Oak. The gates were finished in an OSMO UV protection oil for maximum protection against the weather. Village Gates were hired to install a set of automated hardwood driveway gates in Hale, Cheshire. 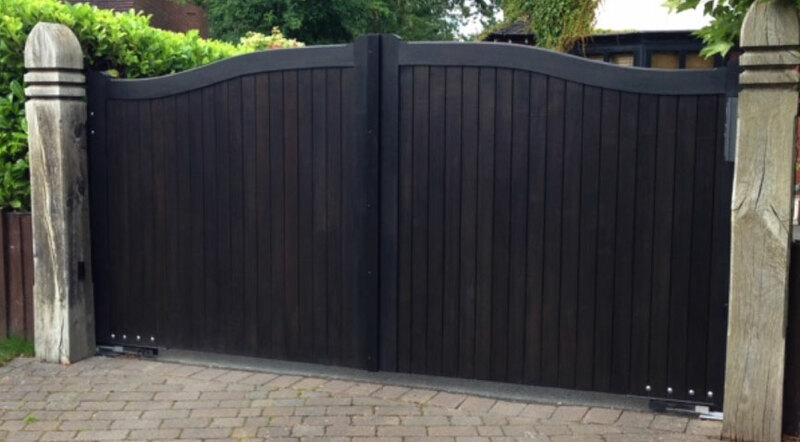 The brief was to manufacture and install a set of swan neck design gates finished in an Ebony stain. Our installers used a Genius swing automation with one opener swinging further than 110 degrees as undergound motors are generally restricted to. The Genius system allowed us to use a cog system to open up to 180 degrees for better access into the drive. We also installed a VIDEX GSM intercom system to allow gate control by the customers mobile phone.